i have been a bit obsessed with this Hard Candy palette lately but that could be due to the fact i have been lusting after a Naked (by Urban Decay) palette for so long i have finally found a dupe that won't cost me $50. hint: if anyone is interested in gifting me the Urban Decay Naked palette i won't turn it down. i used these to items to create a sparkly holiday eye. the picture above shows the glitter in its full glory however the pictures below don't do that sparkle justice. it is even sparklier in person! apply lightest shimmer to the brow bone. apply medium brown shade to crease. 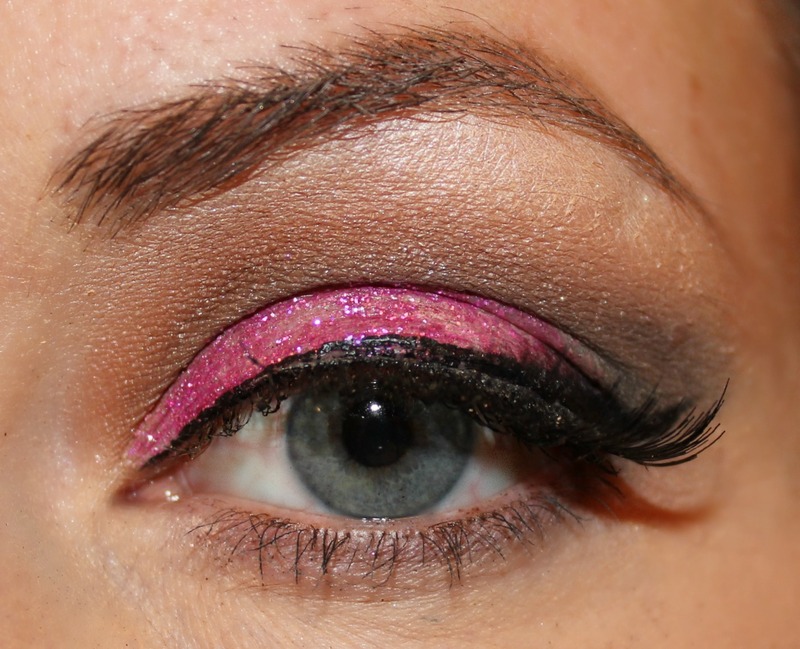 apply Walk The Line glitter eyeliner to entire eyelid. with the darkest brown shade, contour the outer corner of eyelid and into the crease. dramatic liner and false lashes are a must for this look. sparkle and falsies go together like peanut butter and jelly. pretty! Love that pop of pink!